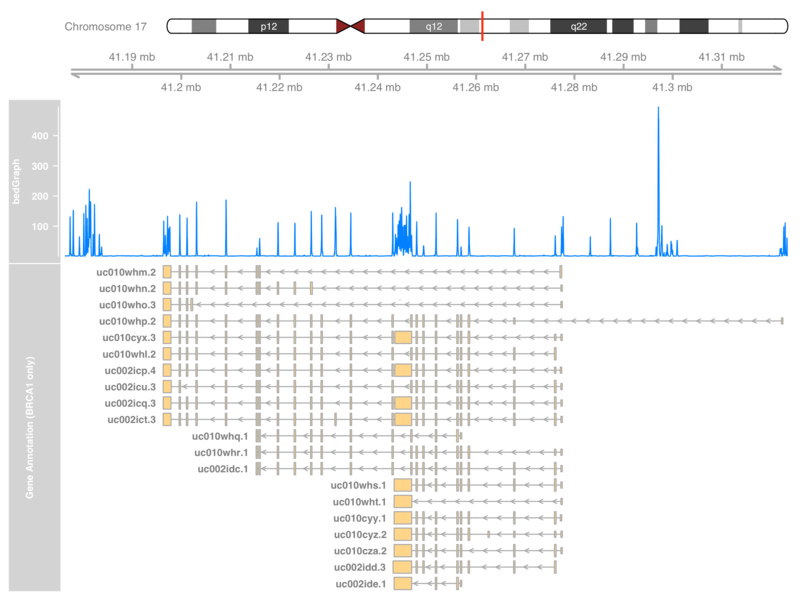 TL;DR Plot exome sequencing depth and coverage with genome annotation using Gviz in R. Then apply detail control on Gviz annotation track displaying. This is an extending post from Genomic Data Processing in Bioconductor, though I haven’t finished reading all the reference in that post. The background knowledge of this post is basic understanding of how to deal with annotation and genome reference in Bioconductor/R. If you don’t deal with genome annotations in R before, you should find some time learning it anyway, a truly life saver. I got the chance trying new tricks today when I and other lab members were analyzing our human cancer exome sequencing data. The results were a bunch of BAM files aligned by BWA-MEM using reference hg19. We want to see how was the sequencing depth and the coverage of all exons designed to be sequenced. 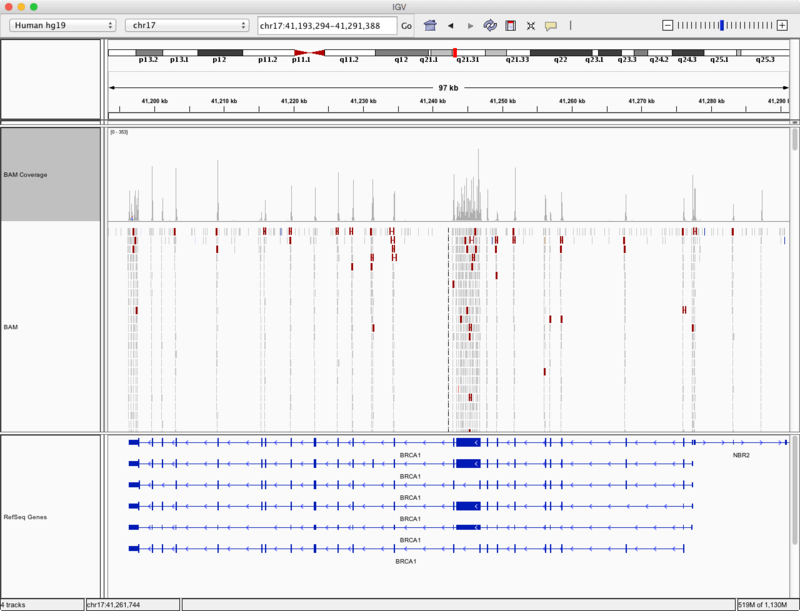 Roughly, this can be done in the genome viewer such as IGV. IGV is good for daily research, but when it comes to customization, there aren’t many options. And if the visualization is aimed for publishing, one might want the figure to be vectorized and, more importantly, reproducible. Therefore, combining with what I learnt in Genomic Data Processing in Bioconductor, I tried to plot the sequencing depth in R with Gviz. I thought learning Gviz will be demanding, since its vignette has 80 pages and the function documentation are scarily long spells. But both of them turned out to be really helpful and informative, especially when trying to tune its behavior. Figures produced by Gviz are aesthetically pleasing, and Gviz has many features as well (still trying). I’m glad that I gave it a shot. If you want to follow the code yourself, any human BAM alignment files will do. 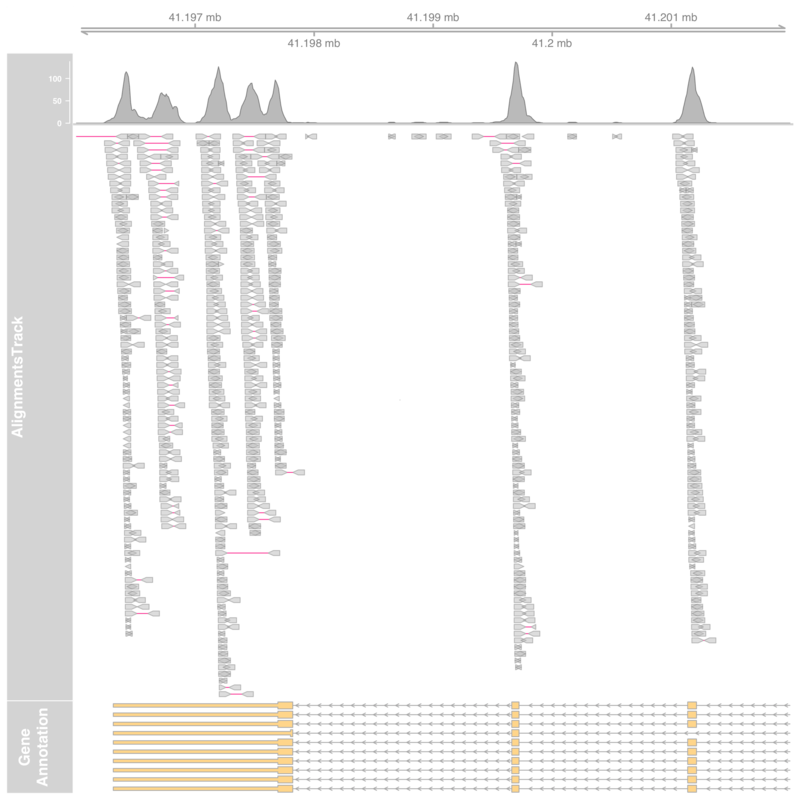 For example, the GEO dataset GSE48215 contains exome sequencing of breast cancer cell lines. So we need to convert the alignment result as BedGraph format, which can be done by BEDTools’ genomecov command. On BEDTools’ documentation, it notes that the BAM file should be sorted. The plain text BedGraph can be huge, pipe’d with gzip will reduce file size to around 30% of the original. 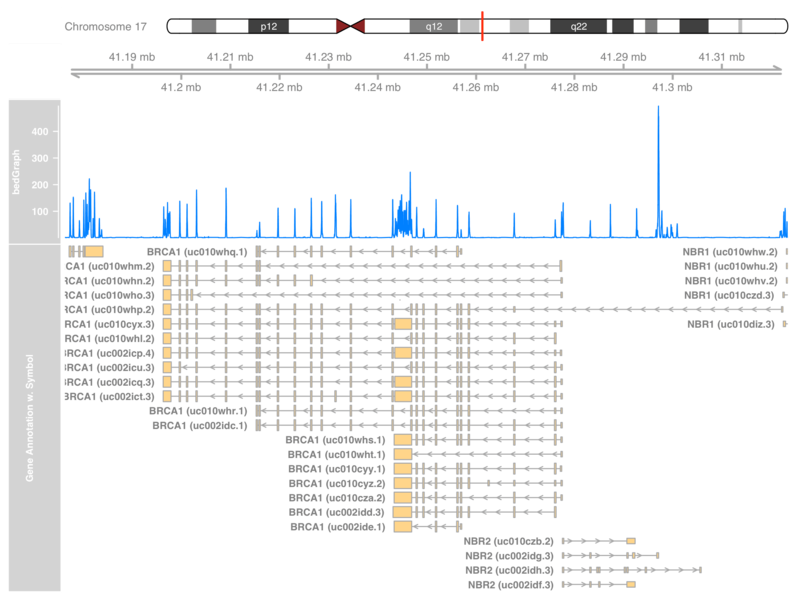 R packages of human genome annotations (Homo.sapiens) and Gviz itself are required. Also, data.table gives an impressed speed at reading text tables so is recommended to use. During the analysis, I happened to know that data.table supports reading gzip’d file through pipe, which makes it more awesome. We should first start at reading our sequencing depth as BedGraph format and plot it. So we read the sequencing depth data, create a Gviz DataTrack holding the subset of our data on chr17, then plot Gviz tracks by plotTracks (though we only made one here) within a given chromosome region. Here is what we got. The figure is a bit weird and lack of information without the genomic location. 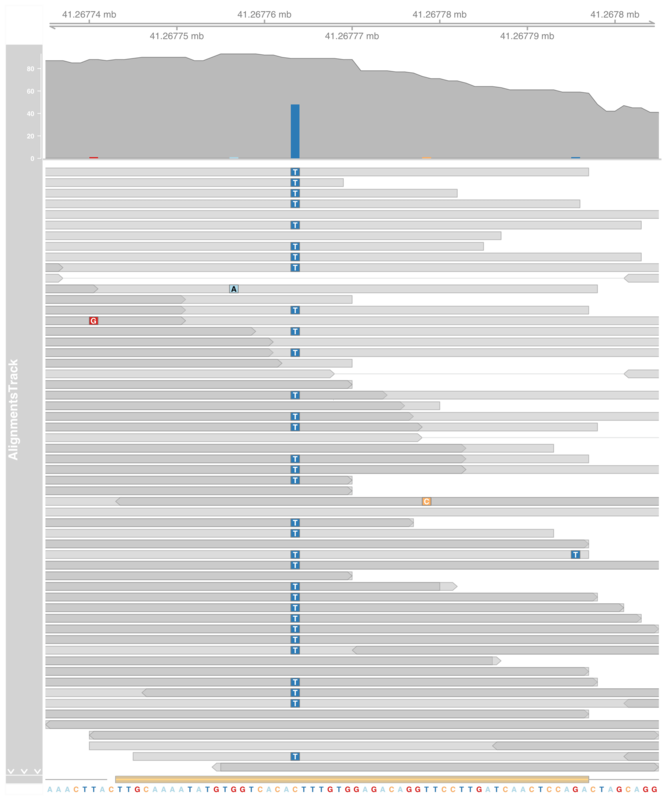 Adding genomic location can be done automatically by Gviz through a new track GenomeAxisTrack. Also, we’d like to show which region of chromosome we are at. This can be done by adding another track, IdeogramTrack, to show the chromosome ideogram. Note that the latter track will download cytoband data from UCSC so the given genome must have a valid name. Since we are using exome sequencing, the curve of sequencing depth only makes senses when combined with the transcript annotations. Gviz has GeneRegionTrack to extract annotation from the R annotation packages. 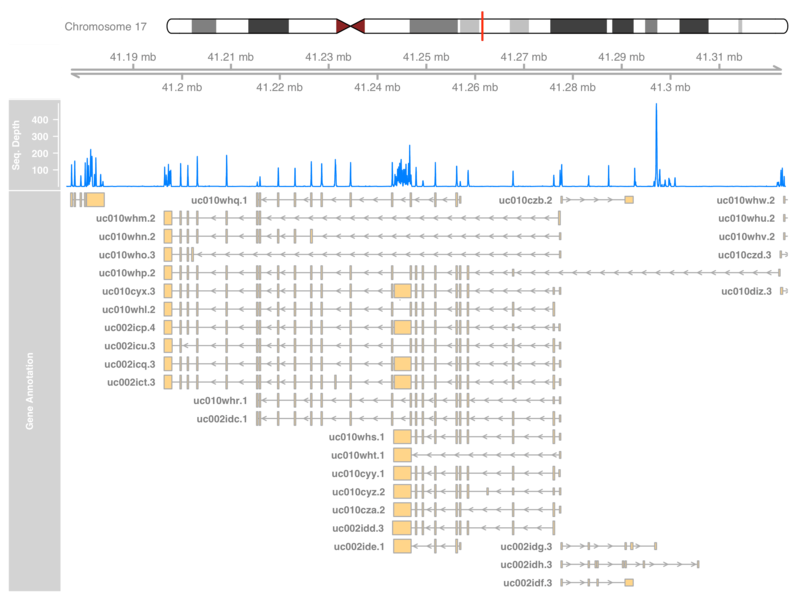 Package Homo.sapiens includes the gene annotation package using UCSC knownGene database. Adding this new track and we will have annotation on our plot. The plot should now be as informative as what we can get from the IGV. In fact, Gviz can plot the alignment result too. It can read the BAM file directly and show a more detailed coverage that matches what IGV can do. I’ll leave that part at the end of this post. Can we show only the annotation of certain genes? knownGene’s identifier is barely meaningless, can we show the gene symbol instead? So here comes the second part, annotation fine tuning. Say, we only care about gene BRCA1. So we need to get its location, or specifically, the genomic range that cover all BRCA1 isoforms. In the following example, I will demonstrate the Gviz’s annotation fine tuning. Look like it has plenty of isoforms! Some space are added at both ends so the plot won’t tightly fit all transcripts and leave some room for the transcript names. Another way to obtain the genomic range is getting the exact range of CDS (e.g. exons and UTRs) for each transcript via exonsBy(). The function returns a GRangesList object, a list of GRanges that each GRanges object corresponds to a transcript respectively. GRangesList is not merely a R list structure, which can correctly propagate the GRanges-related functions to all the GRanges it contain. We have the BRCA1 genomic region, rest of the plotting is the same. Before we start to create our own annotation subset, we first take a look at what Gviz generated. The GeneRegionTrack track store its annotation data at slot range. name = "Gene Annotation (BRCA1 only)"
It’s more obvious now about how Gviz stores the annotation. All we need is to replace the symbol name with whatever we desire. First, we extract the metadata of the GeneRegionTrack, and query for their gene symbols. Using either the transcript ID or Entrez ID will do. Then we concatenate the information of transcript ID and gene symbol using stringr. "RND2 (uc002icn.3)" "NBR2 (uc002idf.3)" "NBR2 (uc010czb.2)"
 "NBR2 (uc002idg.3)" "NBR2 (uc002idh.3)" "NBR1 (uc010czd.3)"
Like how we extract BRCA1-only annotations, we construct a new GeneRegionTrack. name = "Gene Annotation w. Symbol"
So we’ve learnt how to plot using Gviz. You should go explore other data tracks or try to combine sequencing depth of multiple samples. I found the design of Gviz is clean and easy to modify. I think I’ll use Gviz whenever genome-related plots are needed. We will start by replacing DataTrack with AlignmentsTrack. Also we select a smaller region this time so the read mapping can be clearly seen. "myseq.bam", isPaired = TRUE, col.mates = "deeppink"
To plot only the coverage, set the type as coverage. Spend some time reading the documentation, the alignment can be much more fancier. We tweak other tracks as well to make sure the figure won’t explode by too much information. Gene annotations are collapsed down to one liner. Also, aligned read’s height is increased to fit in individual letters (e.g., ATCG). We found a C>T SNP here!